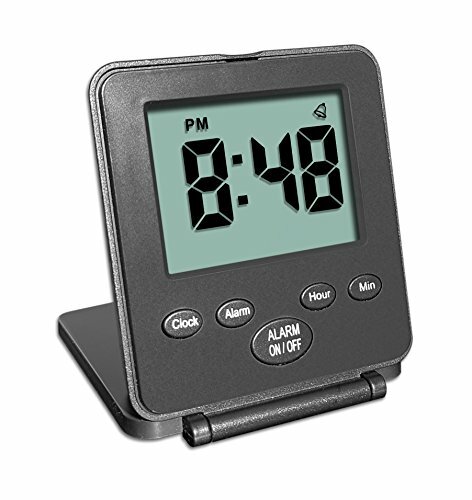 A light alarm clock is a clock that helps you to wake up feeling fresh and go to sleep with far more ease. It also differs from an ordinary alarm clock. It has many different lights and brightness settings, different colors, and you can even run nature sounds on it. Some also turn a light on at least half an hour before you need to get up so you can wake slowly rather than in a rush. The best light alarm clock is also one that will offer sunrise simulation. These provide a light that gently gets brighter to simulate the rising of the sun. It goes from 10 percent to around 100 percent within a half-hour period. While it’s a challenge to find an effective, affordable light alarm clock within your price range, it’s not entirely impossible. You may see any of these options below tick all the boxes for your sleep and waking needs! Philips has been a reputable brand associated with lighting for over 100 years, so it makes sense for them to nail a light alarm clock for consumers as well. If you are having waking up nicely in the morning, then set your sights on this clock. It features a colored sunrise simulation so you can wake up happy, then will lull you off to sleep with sunset fading night lights as well. Philips has added some nice touches to this light alarm clock. But the benefits don’t end there. When you buy it, you get a three-month Headspace subscription and the benefit of many customizable features. Choose from 20 brightness settings, dimming light, five natural wake-up sounds, and an FM radio. Useful for light therapy, this light alarm clock is taking the market by storm, and it could be the very thing you need to get up and out of bed early without feeling like you’re still half asleep! Don’t let the good reviews about this light alarm clock fool you. Even though it has plenty of features to love and it’s affordable so more people can benefit, it also has a number of things wrong with it. Firstly, we’ll talk about why you may enjoy what it has to offer. You can wake up to the sound of FM radio, six nature sounds, and with a wake-up light. It also has touch controls which are sleek and contemporary for your benefit. You can adjust the brightness, choose from three convenient charging methods, and pick a color of four options to suit your needs. What you may not like, however, is that there are no snooze or power buttons to flick off effortlessly, and it’s tough to set. You’re more likely to set it at the wrong time and sleep in! You also can’t lower the volume far enough, so the lowest setting is very loud. It’s an okay light alarm clock, but it’s not the best. If you have problems with your night time and early morning routines, then it might be time to invest in this light alarm clock from Philips. With clinical research to back up its efficacy, it’s well worth a closer look if you’d like to fall asleep and wake up with ease. 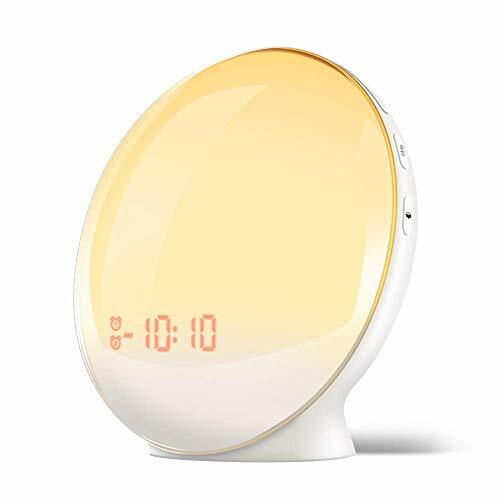 This light alarm clock offers sunrise simulation, ten brightness levels, and light therapy. It also has a contemporary LED display, a bird song alarm, and is available in a sleek and stylish white color scheme. 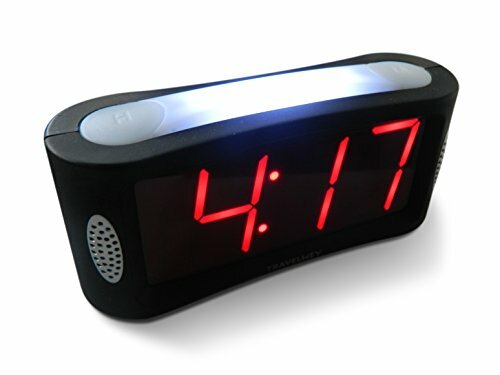 While the plastic casing feels cheap and lightweight, the functionality of this alarm clock will impress. You can set the time with easy-to-follow instructions, choose the brightness level you prefer, then decide whether you want to wake up to the sound of birdsong or not. The price tag of this light alarm clock is also quite affordable, but it’s missing a few vital features. It doesn’t have a battery backup option if you have a power cut, and it also doesn’t come with FM radio. It’s around the same price as other light alarm clocks on the market but without the same convenient features. A small saving grace is the knowledge that Philips is a reputable brand with quality products you can trust. If your kids, or yourself, find it hard to wake up and go to sleep that quickly, then take the time to review this light alarm clock from TITIROBA. It might not look like much, but this light alarm clock packs a punch with both style and functionality. What’s more, it won’t cost the earth. It’s on par or cheaper than many other similar light alarm clocks on the market, but will surprise you with all it can do – that is, when you can figure out how to read the instructions! It comes with a sunrise simulation option, five natural sounds (which you may or may not like) and you can recharge it via USB as well. It also has an LED night light, three brightness levels to suit your needs, and nine colors of mood lighting. Set the scene with red, orange, yellow, purple, blue, and more. While you can’t turn it off – so you can forget that weekend sleep in – and the instructions are poor – it’s still an excellent option for the younger members of the family who need a helping hand to rise and retire. If you don’t have a lot of money, but you’re having a rough time going to sleep and waking up, then this light alarm clock from MOSCHE may be something you can afford and utilize. Even though it’s not a high-end clock that is packed full of convenient features, it’s helpful enough if you are having a few problems getting into a routine. It offers a clear and crisp LED display, eight color lights, and a touch display for ease of use. You can even dim the brightness, use the snooze mode to get a bit more shuteye and enjoy the sleeping mode as well. If you’re struggling to fall asleep, then this light alarm clock will cover all bases. Make use of the ten different natural sounds to lull you off to sleep, as well as the inclusion of FM radio. It’s also sleek, stylish, and a pleasure to put in your bedroom. The only sticking point is that it’s a bit too lightweight so you can push it off your bedside cabinet, and the instructions are hard to follow. If you can work it out, you’re onto a winner. 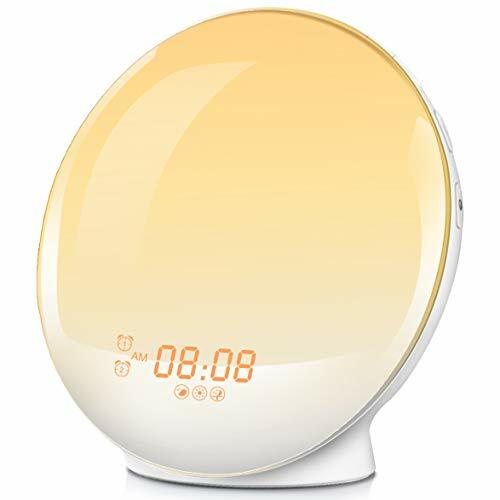 If you don’t mind paying extra if it means you are going to wake up feeling fresh and go to sleep without much hassle, then take a look at this Veholion light alarm clock. Classed as a light therapy lamp, it offers a sunrise simulation, four different natural sounds, white noise, and customizable light options. 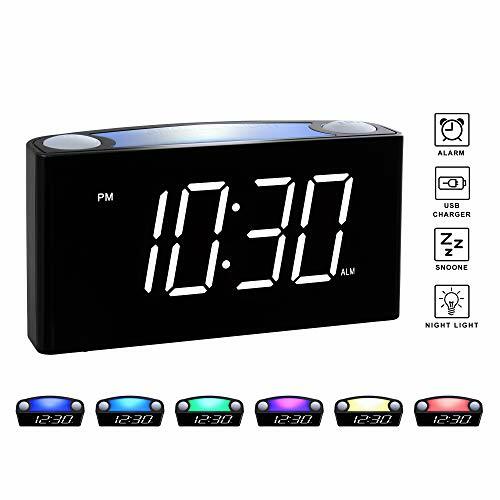 Whether you want dim or colored lights, this light alarm clock can deliver. What’s also sure to impress is the ease of use. It doesn’t take much to wrap your head around how to use it, while also offering a clean-lined LED display. Then, if you wake up and want a few more minutes to rest, you will be able to locate the snooze button when you need it quickly. Sealing the deal is the charging method. You can take this light alarm clock anywhere you go because you can charge it via USB. No longer do you have to be near a power source. Take advantage of this light alarm clock today. Not everyone is able to wake up feeling fresh, or go to sleep immediately – instead, they can need the help of a light alarm clock. That’s where this model from INLIFE comes in. Even though it won’t cost the earth to own, this alarm clock will provide you with no end of convenient as you rise or retire. 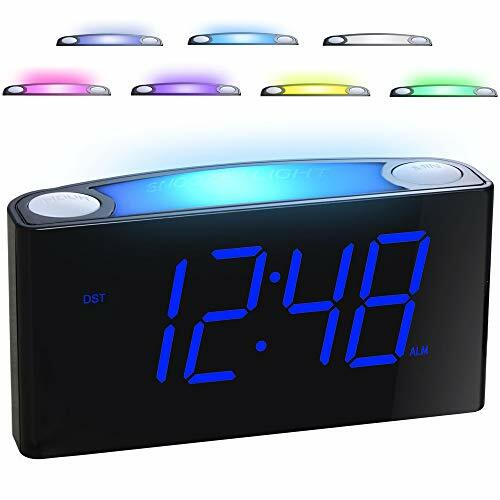 It’s an LED clock with six changing colors, offers a night light and six natural sounds to help you wake or go to sleep with ease. It also provides an FM radio so you can doze off to the dulcet tones of the evening news. This light alarm clock also bucks the trend to even leading brands. You can add a TF or SD card with other sounds as well, whereas most don’t offer that option. It also has a snooze function, touch controls, ten brightness levels to choose from, and a sleep light. There are, of course, issues with how it operates that may be annoying but in no way a deal breaker. The display can be too bright at night, stopping you from falling asleep. You may also find that when you’re learning how to use it, the instructions are not all that clear. As a result, it can be a process of elimination to work out what works and what doesn’t. 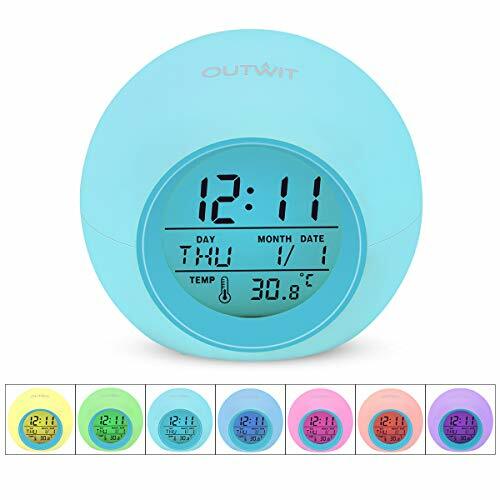 Teaching your children about time is not an easy undertaking, but it can be if you purchase a light alarm clock such as this one from BestXiuyi. Even though it’s not all that easy to get the hang of, the unique color coding system and clock faces can make it an exciting and fun challenge for your children. It shows a sleeping face and glows purple at bedtime, shows a smiling face and yellow glowing when it’s time to play, and a green glow with a grin when it’s time to wake up. While it’s easy to miss the wake-up light and it offers no opportunity for a sleep-in, it shows your children when they can get up and when they can’t. It also has seven changing colors, a one-year warranty, and is ideal for children between the ages of two and five. Begin time training today with this light alarm clock. Whether you’re having trouble sleeping or you want a fun light alarm clock that can do it all, it might be a good idea to take a look at this one from CAFELE. It’s affordable, fun, and is suitable as a desk clock or for use beside your bed! You will also appreciate all the features on offer – be it for a child or yourself. You can charge it via USB for around five hours of music, it has an audio port and TF card slot, and you can connect it via Bluetooth as well. With its inbuilt speaker, you can also use it as a speaker device to work with your mobile phone. 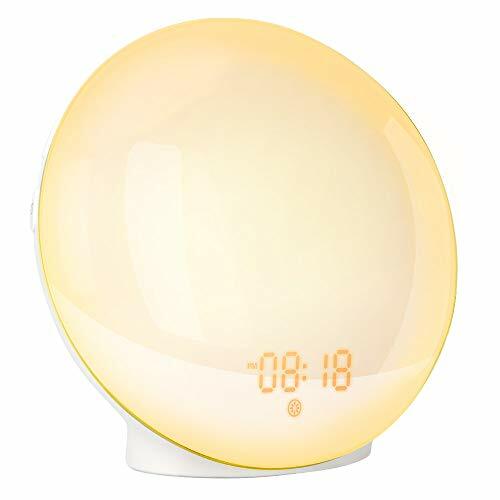 This light alarm clock also has three alarm ring options, an LED nightlight, a timer function, and is available in a sleek and stylish white color. It’s going to appeal to a range of people – and might even appeal to you! Not everyone finds it easy to fall asleep at night or rise in the early morning with vigor. Instead, many of us need a helping hand. A light alarm clock can offer it. However, to avoid disappointment, it’s a good idea to think about what you need, what you like, and what will help you to fall asleep and rise far better than you do now. Consider these points. The power source for light alarm clocks can differ. Some are only available with power cords you plug into the wall sockets. Other models, however, let you charge them via USB, come with batteries, or offer all three power source options in one! The price tag for a light alarm clock can vary dramatically. Typically, the more effective the clock and the more reputable the brand, the more it will cost. While these options are worth your consideration, there are also a few cheaper middle-of-the-road options that are equally as good. Weigh up the features in relation to the cost. 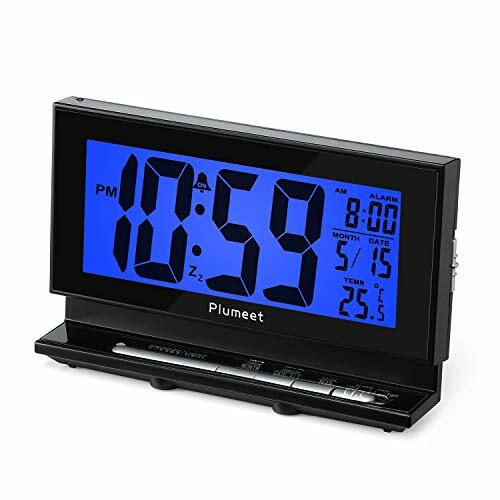 While you may be buying a light alarm clock to help you get to sleep and rise early in the morning, you don’t want an ugly, cumbersome unit sitting beside your bed. Believe it or not, it’s entirely possible to buy an alarm clock that looks attractive, ties in with your home décor, and doesn’t cost the earth. Rare, but possible! Shop around. You are sure to find that the market is more full of options than you thought. Of course, the most critical feature of a light alarm clock is that it’s going to work. While you should be able to find a clock online that you like and press the buy now button, it’s unfortunately not that easy now. Many manufacturers offer inferior quality products that don’t do as they as they say they do – even if they should. It’s more challenging now than ever before to find a light alarm clock that works. There are many things to look out for when checking a clock’s efficacy. Read the reviews. Customers are a good indication of whether a product works or not. But, check them properly. Some manufacturers change listings, so that good feedback for old products shows up as the new product. These are false positives. If you need to, read any manufacturer-supplied research. Philips, for example, offer a clinically-proven light alarm clock that does work. The best light alarm clock on the market is one that comes with a generous warranty period – above and beyond the 30-day offerings from Amazon. When you outlay money for a clock, you do so in good faith. It should work for at least one year, if not longer. If you find a clock you like does not come with a warranty, look for one that does. You can then send it back within that time frame if it doesn’t work as it should.